A minister maintains vitality in ministry in direct proportion to his or her own feeling of effectiveness, irrespective of the criteria by which that effectiveness is measured. Pastoral ministry is deeply influenced by one's person self-definition or self-differentiation. The Center for Pastoral Effectiveness of the Rockies is a series of six retreats over 18 months designed to improve pastoral effectiveness through a process designed to maintain ministers in ministry. The most repeated quote from those who have attended the center is "I wish I had had this 20 years ago, it would have saved me, my family and my churches a lot of grief and stress, and made my ministry more enjoyable." The retreats teach participants how to become well-differentiated leaders, with greater clarity about goals, and less likely to become lost in the anxious, emotional processes which naturally occur in ministry. At the core of the center is Edwin Friedman's classic, "Generation to Generation," which adapts Systems Thinking to Congregational Systems. Systems Thinking is not just jargon, but a journey, a postmodern way of perceiving things and move to the deepest level of emotional process and greatest level of leadership. Retreats are lead by Bill Selby who is the center's mentor and the creator of the Center for Pastoral Effectiveness of the Rockies. His background includes engineering, education and pastoral ministry (United Methodist). He has been a follower of Family Systems since the '70s. He has served all sizes of churches and has a deep understanding of the exciting, yet stressful, dynamics to the call to ministry. 140 contact hours or 14 CEUs will be offered for the retreats. For more information, contact Bill Selby at integrity4u@comcast.net. 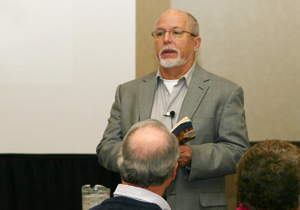 To read more about Bill Selby and the center, go to www.growthwithintegrity.com or www.pastoraleffectiveness.org.